It all started with a truck….an ice cream truck, that is. Over the winter of 1999-2000 Dan, the oldest son of Peter and JoAnn Becker, talked his parents into looking into buying an ice cream truck as a prospective business. After much searching a truck was located and Four Boys Ice Cream was born. The business was named for Peter and JoAnn’s four sons Dan(15) David (11) Luke (5) and Jake (2). hroughout the next several years more trucks were added, and the ice cream truck business flourished. In addition to selling ice cream on local streets and at various parks and recreation centers, Four Boys began participating in local events. Street Fairs, carnivals, and fairs were added to the Fourboys repertoire. 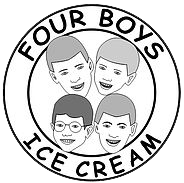 In the Spring of 2004 Four Boys was chosen to be a vendor at the Monmouth County Fair, selling ice cream. Dan, always passionate about the business, researched the feasibility of becoming a soft- serve ice cream vendor. Subsequently the business purchased its first soft – serve ice cream machine, and continued participating in events with this new machine. After realizing success as a mobile vendor, the family decided the next step would be to open an ice cream shop. In the Fall of 2004 Jack Frost Ice Cream and Luncheonette, Tennent Ave, Englishtown decided to sell their business –and Four Boys Ice Cream and Luncheonette was born. We opened in March 2005, and it was truly a family affair. Everyone pitched in and helped grow the business. As in any business, it takes time, effort, passion and a lot of hard work to be successful. In the Fall of 2010 the family decided to focus on the ice cream portion of the business and sold the luncheonette. At this time the event business took off, and Four Boys became a fixture not only at local fairs and events, but throughout the tri-state area as well. Nationally renowned concerts such as Governor’s Ball, Bamboozle and Rock the Bells were some of the first concerts to showcase Four Boys Ice Cream. Four Boys Concessions, a division of Four Boys Ice Cream, continues to add events every year to its rapidly expanding calendar, serving not only ice cream and snack items but delicious food as well. The ice cream shop continued to flourish during this period, and in the spring of 2013 Four Boys opened a second location in Jamesburg. In 2014 Four Boys expanded to the Jersey Shore, running a food trailer on the boardwalk in Belmar for the summer of 2014. Our Jersey Shore location is now at 3 rd and Ocean in Bradley Beach. In the Fall of 2016 a fourth location will be added- Four Boys is arriving in Jackson on Leesville Rd! Four Boys is truly a family business, with everyone pitching in and helping out, working and maybe even taste-testing from time to time!